Sharks play a very important role in the oceans in a way that an average fish does not. Sharks are at the top of the food chain in virtually every part of every ocean; in that role, they keep populations of other fish healthy and in the right balance for their ecosystem. For this reason they are considered by scientists to be a “keystone” species, meaning that removing them causes the whole structure to collapse. Because of this, a healthy shark population is usually one of the signs of a healthy ecosystem. One of the ongoing research projects at Vamizi’s Marine Conservation and Research Centre focuses on a population of Grey Reef Sharks that not only have very special characteristics, but have an extremely important role in maintaining the ecosystem where they are found; keeping it one of the healthiest in the Western Indian Ocean. There is an aggregation of females seen regularly in a specific area close to the Neptune’s Arm dive site (up to 30 can be seen on one single dive), most of which appear to be pregnant. Besides similar aggregations in South Sudan and Seychelles, the Vamizi aggregation is one of very few known in the Western Indian Ocean and the only one along the East African Coast. In order to better understand this aggregation and to answer some of the questions about its behaviour, a project involving acoustic monitoring and satellite tracking was initiated in December 2013 when the first pregnant female was fitted with an acoustic tag. Two more females were tagged in September and October last year, one with an acoustic tag and another with both an acoustic and a satellite tag. A team including freediving world record holder William Winram, as well as shark specialists Nigel Hussey from the University of Windsor and Malcolm Smale from the Bayworld Centre, with support from Vamizi’s own conservation team were involved in this high precision process to fit the tags safely without causing any harm to the animals. How does this tracking work? A total of three monitors have been deployed; these stations are tracking the presence of these sharks around the Metundo area and around the Point, just off Lighthouse beach. Each acoustic monitor has a range of about 200m, depending on the conditions and geography of the area. When a tagged shark swims by within that range, a ping is transmitted from the tag to the receiver, and the information regarding the specific tag and timing is stored. This lets us know that the tagged animal was in that area at that specific time. Every month the data stored in the acoustic monitors is downloaded and added to the database, after which it is analysed. The satellite tags work in a slightly different way. They don’t rely on receivers, and because grey reef sharks rarely come to the surface, they store the information for a set period of time (in our case we are using tags with a 30 day capacity). Once the set time has passed, the tag has a detaching mechanism and a buoy that send it to the surface. The tag can then connect to a satellite and transmit the information it had been storing. These tags give us information on temperature and depth. We are now preparing a detailed report and analysis of the first 6 months of activity. Already it looks like the sharks we tagged are spending a lot more time around Neptune’s than we initially expected, one of them being detected around the monitor almost at every hour of every day. Preliminary results from the satellite tag also show that even though these individuals make multiple deep dives below 100m (the deepest was 200m), they spend most of the time on an average of 20m of depth. This kind of information is not only important to help us understand more about the behaviour and dynamics of this shark population, but it also informs us on the importance of the area used by these individuals, as well as the seasonality of their presence. 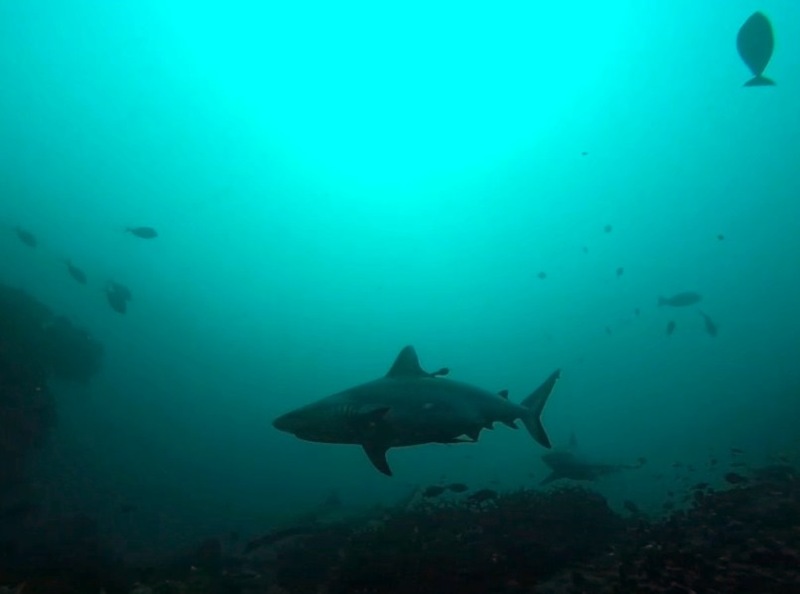 Sharks are extremely vulnerable to fishing pressure, as well as to disturbances in the environment they rely on, so by understanding exactly what their role is in this environment and how vital this area is for the survival on this population, we can make informed and logical decisions when it comes to their conservation of the conservation of the habitat they live in. Lucy was adopted by a guest and was fitted with both a satellite tag and an acoustic one. Here you can see her swimming along the following day, with the satellite tag attached to her dorsal fin.